The cover says this one cost twenty-five shillings when it was printed, which makes it a bargain at only ten pounds, over thirty years later. In a superb piece of detective work, Paul Morgan at Coch-y-Bonddhu Books has managed to track down a couple of packing cases of mint first editions, still in vibrant dust wrappers, which were somehow overlooked and remain unsold, though I suspect not for much longer. 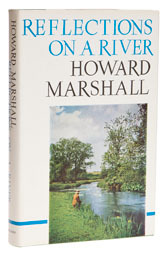 Reflections on a River has minor classic status thanks to its author’s choice of subject and writing ability – Howard Marshall was a well-known radio commentator, whose broadcasts covered everything from the D-Day landings, to the Coronation. Reflections has much in common with Plunket Greene’s ‘Where the Bright Waters Meet’, only this book is mainly about the Lambourne, a miniature chalkstream that feeds the Kennet. I think I am going to have to read it again.